Waaaay back in graduate school for direct marketing (circa 2003), I learned about the importance of connecting with customers and clients. One of the easiest and best ways to do this is the email marketing newsletter, and I use Constant Contact for that after using their free trial. I want to share a recent example of good direct marketing via newsletter to give you a reminder about how well this works. 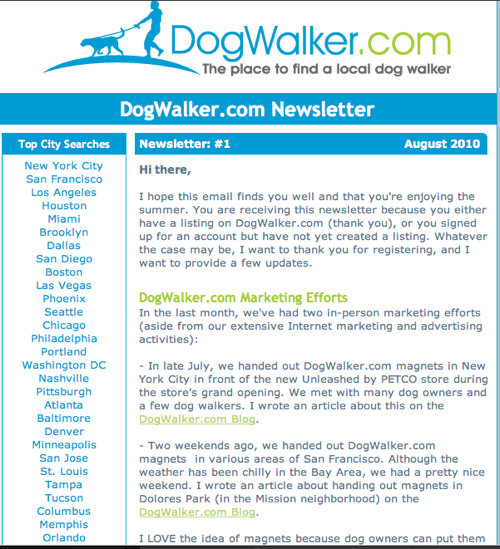 On DogWalker.com, I have over 1,100 registered accounts, with around 25% of them having paid listings. This might seem like a good sales/close rate, but I believe if dog walkers take the time to register on the site, they probably have an interest in signing up for a listing, but I just need to convince them to spend the money. After 8+ months of being live, I decided to send out the first newsletter a couple of days ago (see screenshot below). The newsletter discussed the current traffic levels on site, the two local marketing efforts done in the last month, and some of the Internet marketing efforts. I also listed the top city searches the site received in the last 30 days, which I think was smart because people can cross-check that list with the number of listings to determine whether their listing will stand out. All in all, the open rate was pretty strong, especially for the summer. Most importantly though, it netted $200 in revenue, yielded very few complaints, and it opened the door for further communication. It was fairly quick to set up using Constant Contact, and I know they will help you if you run into trouble with the design (my Dad did it for his store and they helped him set up his newsletter a couple of months ago). If you run a website with subscribers (paid or not), you should have a newsletter. I have the option to use one for my blog, but I generally have too many things going on to create a newsletter for a smaller audience. Very informatitive. I have been wondering about the same thing. I will try a couple of sites over the next few weeks and report back if I have time. I really like the idea and has worked great for one of my customers to get more business just by keeping the name out there and asking for business. For low volume lists and trials does any one know of a free HTML e-mail process? Elliot thank you for sharing the real facts of real life examples I really think this makes your posts worth following and learning from. Thanks again for sharing Elliot, awesome project! As a PS to this – for domain resellers, maintaining a list of buyers/prospective buyers should be a priority. Don’t overlook the value of it. Many people think you need to be doing huge volume to make it worthwhile but that isn’t the case. My company http://Listcast.com has provided email list management services for dozens of domainers. Some have as few as a dozen subscribers. Although most are private, some like Eric Rice’s are public. We’ll be setting up a site soon at DomainNewsletters.com for domainers with sales newsletters open to the public.